One part of World of Warcraft that is often overlooked by players is the daily quests. There are daily quests available throughout Northrend, and various benefits can be gained from each one. A daily quest is one that can be done over and over, once per day. Depending on exactly what you want to gain from completing your daily quests, you’ll want to complete various WoW dailies every day. Some WoW factions give you access to very valuable enchantments and rare gear for purchase. This is why you might consider running daily quests as part of your reputation grind. For example, one of the most important reputations you can farm with dailies is the Sons of Hodir. They offer shoulder enchants for almost any class, along with several rare patterns for characters of various professions. If you’re just looking for an achievement from reputation, then you also might consider completing daily quests as part of the achievement you are seeking. Players on WoW are always looking for new ways to farm for gold, and the beautiful thing about daily quests is that they provide a regular source of income that’s only as risky as the amount of time you have in a day to play World of Warcraft. When you complete daily quests, you always know exactly how much gold you’re earning from each quest. This provides a very stable source of income, as opposed to the auction house, which involves a major gamble every time you post something. Some daily quests also hold the key to earning special mounts. One of the fastest flying mounts in the game is only available through a daily reputation grind, and many players love to earn these special mounts. These mounts provide a little bit of variety and a lot of status for the WoW player who prides himself on having all the exclusive and hard-to-get items. For characters that have not yet reached level 85, there are some lower level daily quests that will provide experience. 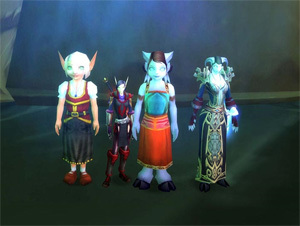 Many of these quests also provide reputation with one of the WoW factions, but some players simply choose to level by completing daily quests. They provide a good way to get into a regular routine when it comes to earning experience, especially if you only have a little bit of time each day to play World of Warcraft. Just remember to update your daily quests with every level you hit. One of the newer set of daily quests is the set of dailies in the Argent Tournament Grounds. These are probably among the most important daily quests in the entire game because you can earn valuable gear and upgrades for the gear you already have. Just as Frost and Triumph badges allow you to purchase gear, running your daily quests in the Argent Tournament Grounds will allow you to purchase other gear in the Argent Tournament Grounds, which could improve your gear score enough to get you into Icecrown Citadel.